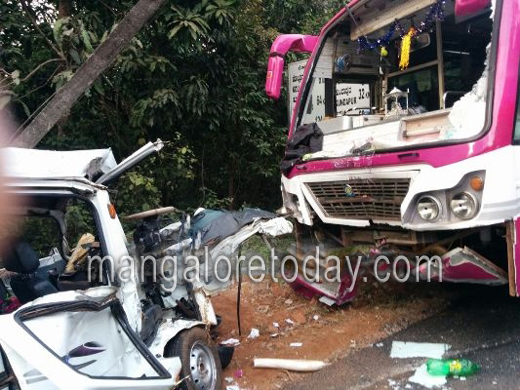 Kundapur, Dec 23, 2014: As many as eight people sustained injuries in a head-on collision between a Maruti Omni and a tourist bus near Jadkal on December 22, Monday. The Omni had nine persons who were returning to Kollur after attending a function at Siddapur. The tourist bus was heading towards Kundapur from Kollur. The impact of the collision was such that the front portion of the Maruti Omni was badly mangled. The injured namely Nagaratna (36), Shubha (30), Kusuma (42), Ratna (36), Ratnaker (23), Jalaja (35), Abhilash (22) and Renuka have been admitted to a private hospital in the town. A case has been registered by the Kollur Police.